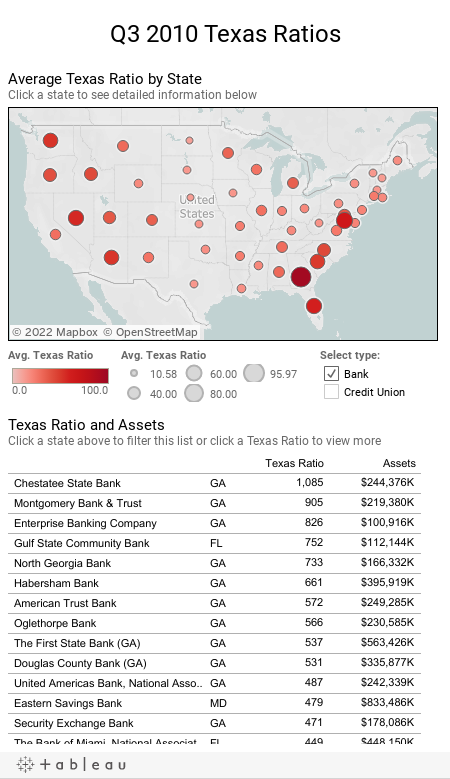 This interactive Texas Ratio display contains data for every bank and credit union found in 3rd quarter FDIC and NCUA reports. This is a lot of data and it may take extra time to load. Please be patient. It takes an extra 3-5 seconds on my computer. Your results may vary. If you have an inadequate memory, the display may be slow or inoperable. Thanks to Ellie Fields and Ross Perez at Tableau Software for help with the display. The Texas ratio is a measure of a bank's credit troubles. Developed by Gerard Cassidy and others at RBC Capital Markets, it is calculated by dividing the value of the lender's non-performing assets (Non performing loans + Real Estate Owned) by the sum of its tangible common equity capital and loan loss reserves. The higher the Texas Ratio the higher the risk of failure. Ratios above 100% may be problematic.